We have seen plenty of films dealing with people suffering from mental or physical diseases over the years. But, in my opinion, when it comes to films that deal with this kind of subject matter that show how it affects the families, we hardly see it from the p.o.v. of the victims themselves. Thankfully, films like Silver Linings Playbook and the subject of this review, Still Alice, have broken that trend and show how the family handles such harsh diseases rather lovingly and don't just show the ugly side of it all. 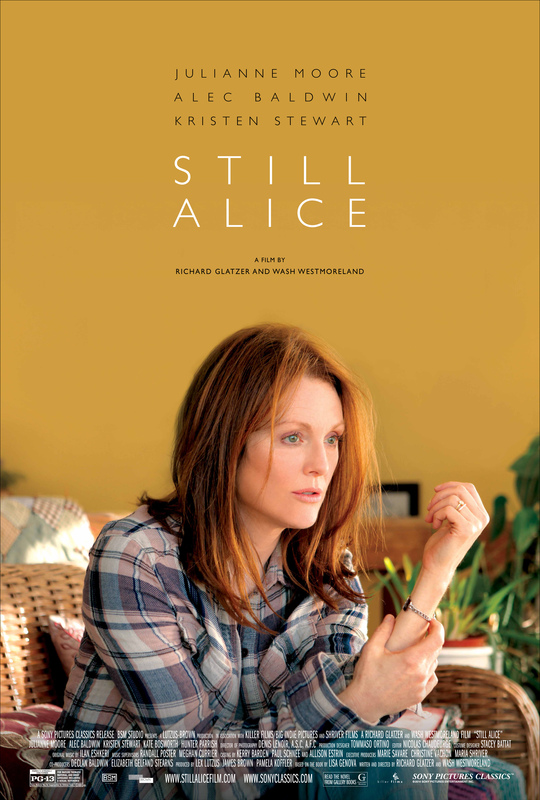 Still Alice follows the story of a Columbia linguistics professor named Dr. Alice Howland (Julianne Moore) who begins to realize that she is suffering from early onset Alzheimer's. The film then starts to follow not only how it begins to affect her but the lives of her husband (Alec Baldwin) and children (Kristen Stewart, Kate Bosworth, Hunter Parrish). One thing that I really liked was how the film was directed and how it manages to showcase the p.o.v. of the person dealing with the illness. Usually, whenever we see a film about a person suffering a physical or mental illness, like Amour, it tends to be from the p.o.v. of the loved ones. But we see how Alice is being affected by her disease and we begin to connect with her as the film progresses and her disease worsens. The film's directors, Richard Glatzer and Wash Westmoreland, are a couple dealing with illness themselves as Glatzer is suffering from ALS and it feels as if the camera came from their hearts. Next, I'll get into the acting. Julianne Moore does outstanding, career-best work as Alice Howland and infuses such layered depth into her character. The genius of her performance is that she is able to try and ground her character into reality as Alice is going on a slow mental descent. Moore showcases a rather refined and quiet desperation without it being too internalized. She also has some great support from her fellow castmates. Kristen Stewart is able to let her acting talents shine as Alice's mostly absent yet loyal starving artist daughter Lydia. I know she gets a lot of crud for those god-forsaken Twilight films, but it is films like this, The Runaways, and Speak that allow her to cut her acting teeth. Thankfully, because the Twilight films made a boatload of money and are through, she is now able to continue doing small films that matter. I even thought that some of the highlights of the film were the ones between Moore and Stewart as they have wonderful chemistry. The rest of the cast, Alec Baldwin, Kate Bosworth, and Hunter Parrish, are also outstanding and help create this powerful family dynamic that takes place. Overall, Still Alice is a quietly heart-wrenching look into how diseases affect the family dynamic. The performances are all astounding, especially from Moore and Stewart while the direction by Richard Glatzer and Wash Westmoreland is absolutely poetic and the story is enough to get a teardrop out of your eye without being too sentimental. I would say yes if you are a fan of the actors and/or if you ever lived with somebody that suffered from a physical or mental ailment. At first glance, some may look at this film as mushy awards bait, but I would say give it a shot. You might be as surprised as I was.